The time: nine o’clock on a Tuesday night. The place: a corner by a gas station in Havana, Cuba. The players: A handful of college students, elegantly dressed and waiting to hail a cab to a classy jazz club. A sky-blue vintage Chevy pulls up and the students ask, in Spanish, if the driver can take them to an intersection about five straight miles down the road. He assents and they pile in and take off, the tropical early spring breeze blowing through the Chevy’s open windows. Unexpectedly, the driver takes a right. Half a block down the road, he pulls a u-turn and keeps driving straight. The students raise their eyebrows to one another, knowing full well that there are no turns on the way to their intersection. The driver pulls into a parking lot outside of a poorly-lit hotel. The students are convinced that their lives will be over after two short decades at the hands of a Cuban taxi driver. Instead, the driver asks for directions. The students are completely bewildered. Their destination is a well-known intersection in Havana. And the man supposedly drives the streets of Havana in his taxi for a living. After a few more stops and requests for directions, the taxi driver finally found the right intersection and the students pile out. Such is a night in Cuba riding around in an almendrón. Let me explain about these taxis. When you see a vintage American car with a taxi sticker in the window, the first thing that comes to mind is probably not a tasty and nutrition nut. 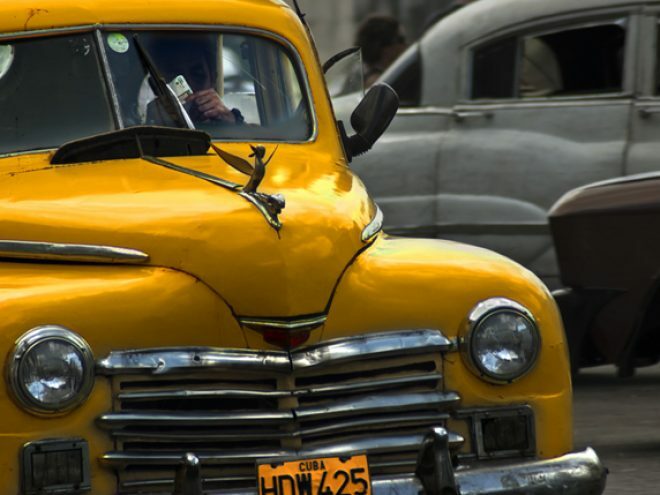 But for whatever reason, in Cuba those taxis are called máquinas, which means machines, or almendrones, which means almond. Like almonds for a mid-afternoon snack, the almendrones are usually incredibly convenient. And luckily, unlike almonds, almendrones are cheap. They run all over Havana on different routes, which are indicated by different hand signals that might be mistaken for gang signs. If you don’t know the hand signals, the driver will just ask you where you’re trying to go and if it’s on his route, you jump in. Depending on the destination, you pay 10 or 20 national pesos. Just for reference, there are 24 national pesos to one Cuban convertible peso (CUC). One CUC is approximately equivalent to one dollar. So, for less than one dollar, you can more or less get all over Havana. Granted, you might have to walk a little bit once you hop out of the almendrón, but far worse disasters have occurred. The interior of the cars is like a pathetic set of bumper cars at a state fair where all the carnies are probably escaped convicts. The floor is steel and the seats ripped leather. The cars were made before suspension was invented. The engine is being held together by duct tape and wishful thinking and probably runs on rum and government-rationed coffee. The drivers have to put the force of their whole body into shifting gears and a stalled or broken-down almendrón is as common as a white girl in a Whole Foods. The breaks squeal louder than teens at a Justin Bieber concert and the cars slowly putter backwards when stopped at a light. Once when riding in an almendrón, I saw spray painted on a wall “Vivan los almendrones.” Despite my experience with an incompetent almond driver, I wouldn’t trade those little suckers for anything. Long live the almond.